Mattel's Monster High® Brand to Promote Tween-Esteem Through Pro-Social Back-to-School Program at Walmart | Mattel Inc.
LOS ANGELES--(BUSINESS WIRE)-- This July, when girls head to Walmart to do their back-to-school shopping, they will be greeted by a new member of Mattel's Monster High® brand, the popular tween franchise centered on the teenage children of famous monsters. Emily-Anne Rigal, 18 year-old founder of non-profit WeStopHate.org, joins the Monster High® student body to spread the word of tween esteem in a pro-social program with the retailer. The in-store call-to-action will elevate and extend the Monster High® and WeStopHate collaboration to inspire tween girls to celebrate and embrace the unique qualities that make them "perfectly imperfect" through specially-created online content, downloadable activities, and an animated webisode featuring a monsterfied Rigal. The partnership with Rigal, the YouTube "cause-preneur" who has been honored by Nickelodeon and the ultimate "Mother Monster" Lady Gaga herself, is the second of its kind for Monster High®. It continues the brand's commitment to supporting girl-founded organizations which promote positive messages for tweens. In 2011, Monster High® partnered with the Kind Campaign, a girl-founded movement and documentary dedicated to spreading messages of kindness. "Emily-Anne's messages of self-acceptance and esteem-building are vital for tweens today and perfectly align with our brand's mantra of celebrating your individual fun freaky flaws," said Lori Pantel, Vice President, Global Brand Marketing for Monster High. "Together with Walmart, we can introduce, empower and educate girls with this message as they prepare for a new school year." Self-Esteem Check List: Developed by Rigal, this thirteen point checklist provides girls with helpful tips and tricks to inspire the freaky fab in all of us. From creating a fang-tastic playlist to rockin' a gore-geous accessory as your signature piece, each tip serves to boost one's self-esteem. Love, Yourself Letter: Inspired by Rigal's "Love, Yourself Letters" on WeStopHate.org, this activity encourages girls to write themselves a letter about what makes them uniquely freaky fabulous. Monsterfied Mad Libs: In this monsterfied Mad Lib, Monster High® student Draculaura®, - who is unable to see her own reflection in the mirror - proves that trusting ghoulfriends that you are beautiful inside and out can boost your confidence. Mirror Mirror, on the Wall, Love Yourself — Imperflections™ and All (June 13th): Monster High® digs up an interactive online experience where girls will get to "take back the mirror," and resurrect a positive self-reflection by re-writing how they view themselves — from the inside out. Girls are invited to take or upload a photo of themselves to the online mirror. Then, they are given a series of positive, monsterfied sayings that they can apply to their mirror, print out or save to celebrate their imperflections™. Walmart In-store & Online Merchandising (July): Walmart joins Monster High® in its efforts to build self-esteem among girls via special displays at more than 1,500 Walmart stores across the country. In addition, Walmart.com will also feature self-esteem building downloadable activities as well as special Monster High® and WeStopHate animated content that highlights the importance of positive self-esteem. 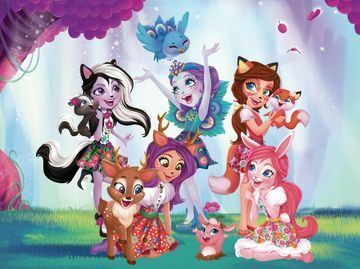 Animated WeStopHate Webisode (Mid-July): Leveraging the popularity of Monster High™ webisode content, which has generated more than 150 million video views, Rigal will become the star of a special Monster High™ webisode. As an animated monsterfied character, she will share the WeStopHate message of self-acceptance with Monster High® students, Frankie Stein®, Draculaura® and the rest of the Monster High® characters. "The words tween girls use to describe themselves hold a lot of power over how they ultimately see and feel about themselves," shares Emily-Anne Rigal, founder of WeStopHate. "I am so excited to be partnering with Monster High to inspire young girls with playful, positive messages that they can use to resurrect a positive self-reflection and celebrate that we are each perfectly-imperfect just the way we are!" Launched in 2010, the Monster High® franchise has quickly exploded in popularity attracting a highly engaged global student body of tween fans. The brand currently boasts the #2 largest Fashion Doll property according to The NPD Group1, a New York Times best-selling chapter book series, heavily viewed animated online and television entertainment, more than a million "likes" on Facebook, and a monsterously successful consumer products collection. WeStopHate is a Realize Inc. non-profit program dedicated to raising self-esteem in teens (teen-esteem) through various social media platforms that engage teens to help each other gain confidence. Why? Because teens who are happy with themselves won't put others down. Stopping bullying means putting an end to the lifelong, painful consequences each victim suffers — and that creates a better world for us all. WeStopHate is more than just an anti-bullying program... It's a call-to-action to stop hate: stop hating on yourself, stop hating on others, stop letting others hate on you.